Surprise your collegues in the morning with a tasty single-portion (8 bags 50g each). 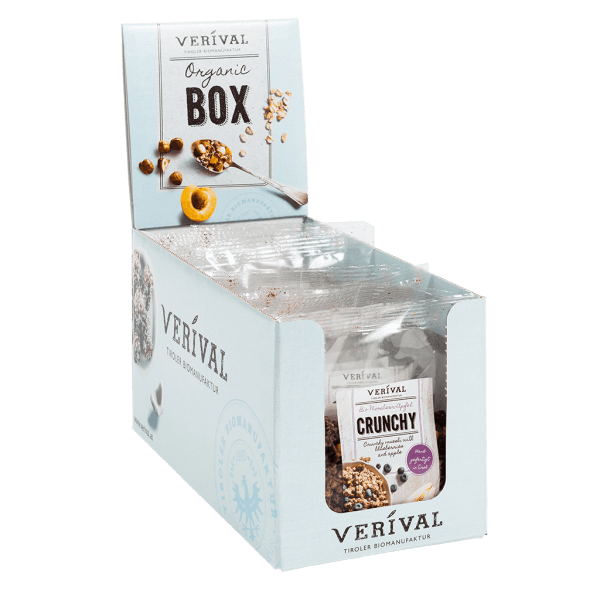 Crunchy clusters of oats and barley, sweetened with raw cane sugar, mixed with blueberries and diced apple and toasted and mixed to perfection by hand in the Austrian Tyrol. Deliciously biscuity and 100% organic. Good morning! Oat flakes*, raw cane sugar*, barley flakes*, high-oleic sunflowerseed oil*, grape seed flower*, coarsely ground oats*, puffed rice*, apple cubes* 3%, blueberries* 1%, natural aroma: blueberry 0,3 %, aronia powder, salt. > May contain traces of nuts, lupines, sesame seeds and soy.